At any given time of day, on almost any day of the year, you will see runners taking on the streets and trails of Boston. Boston hosts the country’s oldest marathon, boasts beautiful running trails, and seems to have an endless number of motivated runners, making it hard not to catch the running bug while living here. Not surprisingly, many Friedman students, faculty, staff, and alumni are part of the running community in Boston. Over the last eight years, several Friedman students have participated in the President’s Marathon Challenge (details below). 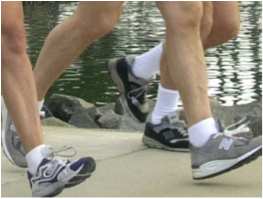 They also join the weekly runs at the Medford campus, and some have started running groups in their individual neighborhoods. Whether you’re a new runner or a seasoned marathoner, it’s easy to find a group or buddy to run with and there is certainly no lack of places to run in Boston! If you’re new to Boston, living in a new neighborhood, or just looking to explore New England’s largest city, running is a great way to experience Boston. Boston and its surrounding areas offer a variety of running trails, all accessible by foot or public transportation. As locals will tell you, it’s in your best interest to stick to the trails as much as possible with the, sometimes oblivious, Boston drivers out on the road! The list below provides you with some of the most popular trails in and around Boston. Is biking more your thing? Most of these trails are bike –friendly as well. And you will certainly find your fellow Friedman friends biking to class or heading out for a longer ride in the evenings or on the weekends. Now lace up those sneakers or hop on your bike and get out and enjoy the crisp fall air before the snow hits the ground! Charles River Reservation: When it comes to the running scene, there is nothing that screams Boston more than a run along the Charles. 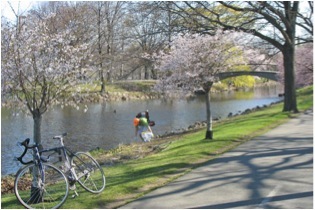 The Charles River Reservation offers one of the most popular biking and running paths in Boston, with the Paul Dudley White path spanning 18 miles from Science Park to Watertown Square. It is accessible from both the Boston and Cambridge sides of the river, and there are several bridges that allow you to cross and create shorter or longer loops of your choice. The three closest t-stops include red line to Harvard Square, Kendall Square, or Charles/MGH and the green line to Arlington. Boston HarborWalk: The HarborWalk is the longest trail in Boston, with 46.9 miles of scenic, waterfront paths. If you’re looking for a path with conveniences like water fountains and bathrooms, this is a good option. The HarborWalk is accessible from several t-stops throughout downtown Boston, East Boston, South Boston, Dorchester, and Charlestown. Emerald Necklace: the Emerald necklace is a chain of nine parks, gardens, waterways, and paths that run through Boston and Brookline. It includes: Boston Common, Public Garden, Commonwealth Avenue Mall, Back Bay Fens, Riverway, Olmsted Park, Jamaica Pond, Arnold Arboretum, and Franklin Park. 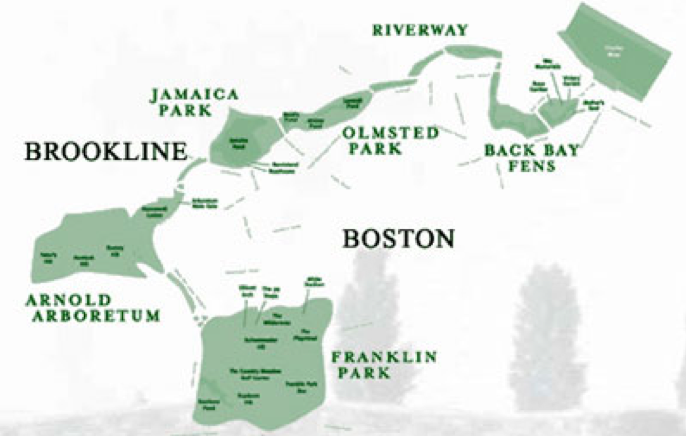 As you head out toward the paths in Jamaica Plain (Riverway, Omsted Park, Jamaica Pond, Arnold Arboretum, and Franklin Park), it feels like a mini-escape from the city! This is a great place to train for fall races if you are looking for some hills. This string of parks is also the home to the Boston Half Marathon, which takes place in early October. The Emerald Necklace is accessible by several orange, green, and red t-stops. Southwest Corridor Path: This 4.7 mile long path follows the orange line T from Forest Hills through Jamaica Plain, West Roxbury, the South End, and ends in Back Bay. It’s full of commuters and is an easy way to ride or run into downtown Boston from the southern parts of the city. Be aware that there are several parts of the path that cross traffic, so be prepared to stop along your way. Hop on it at any stop on the orange line between Back Bay & Forest Hills. Chesnut Hill Reservoir: For those living in Brookline or Brighton (or for the adventurous souls who want to take a ride on the green line), this path presents a nice option for a 1.5-mile loop around the reservoir. Runners looking for a softer terrain particularly enjoy the packed dirt path. Take the green C line to Cleveland Circle. Somerville Community Path/Alewife Linear Park: This nicely paved, 2 mile, flat path connects Somerville and Alewife to the Minuteman trail. It can be crowded with commuters, dogs, and strollers, particularly around Davis Square, but once you get out towards Alewife and the start of the Minuteman path, it clears out. And, it’s definitely a more enjoyable way to get to the Minuteman path than attempting Mass Ave. Take the red line to Davis Square to access the trail. Minuteman Bikeway: Also known as “America’s Revolutionary Rail Trail,” this path extends from Alewife to Bedford, crossing through Arlington and Lexington. There are two bike shops along the path and opportunities to cut off the path to explore Arlington and Lexington. It also gives access to the path around Fresh Pond (see below). Get there from Davis Square (via Somerville Community Path) or Alewife, both on the red line. Fresh Pond: This is a great running path for those looking to run near water, but don’t want to trek from Somerville through Harvard Square to get to the Charles. The running path is a flat 2.5-mile loop around Fresh Pond and provides a nice, easy escape from the city. If you’re running longer distances, it’s a great add on to the Minuteman trail, which can get monotonous with long distances. It’s about 0.7 miles from the Alewife T (red line) or you can take the 72 bus to Huron and Larch St.
Stony Brook Reservation: If you’re looking for nature and few crowds without having to drive, Stony Brook Reservation is the place to go. The reservation has 12 miles of biking and running trails that wind through the forest and near Turtle Pond. Take the orange line to Forest Hills and then the 40 bus to Alwin St. or the 32 to Pingree St.
Lower Neponset River Trail: This 2.4 mile-long trail connects Milton and Dorchester to other Department of Conservation and Recreation trails in Boston, by winding through the Neponset marshes. Much of the trail runs along the Neponset River and crosses through Pope John Paul II Park (picnic facilities, soccer fields, and playgrounds), providing the runners and bikers of these neighborhoods a safe, scenic route. Get here by taking the red line’s Ashmont branch to Butler, Milton Village, or Central Avenue. Looking to run with other Tufts students? Join the Tufts running group Wednesdays at 7a and Sundays at 8a for training runs between 4-14 miles, depending on your fitness level. Interval training sessions also occur on Thursdays at 4:30. Visit the President’s Marathon Challenge site for more information. The PMC is a team of 200 Tufts students, faculty, staff, alumni, friends, and family who run the Boston Marathon and raise money for nutrition and health research and programs. Runners train together throughout the fall and winter with the help of Coach Don Megerle. PMC runners do not have to qualify for the Boston Marathon, but are required to fundraise as part of the team (students: $1,000, all others $2,500). Former president Lawrence Bacow started the PMC in 2003, with a goal of connecting the Tufts community and raising funds to support university programs related to health and fitness, much of which often supports the Friedman School. To join the team or find out more information, visit the PMC site. *Image credits: Boston Discovery Guide, Emerald Necklace, and Minuteman Bikeway. Sarah is a second year student completing a dual degree in Nutrition Communication and the Didactic Program in Dietetics. When not writing for school, the Sprout, or her internship, Sarah enjoys running, teaching spin, and testing out new recipes to share with friends and family!